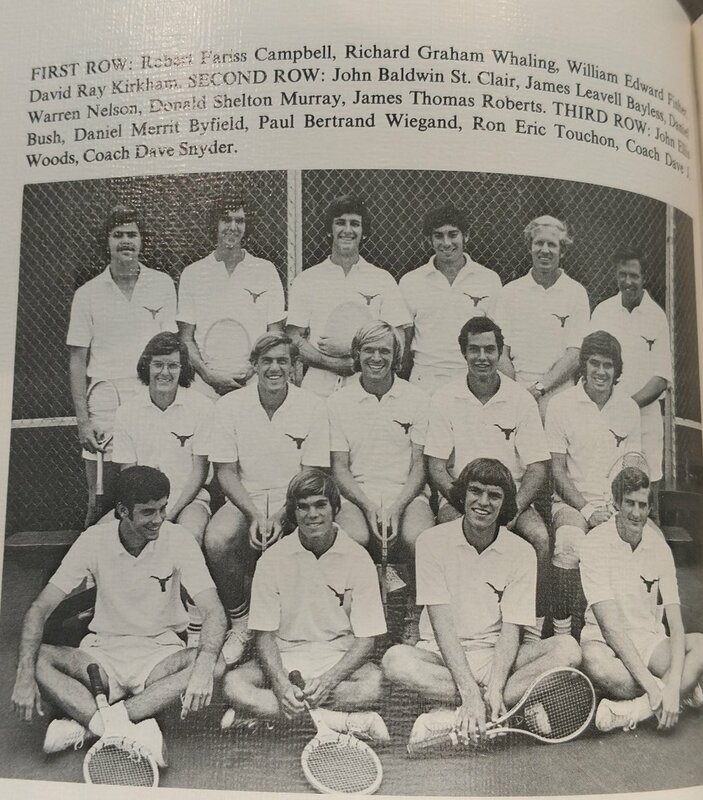 Tennis and golf represent Longhorn excellence and a portal to the past that reminds all Longhorns that heritage shapes the present and empowers the future. 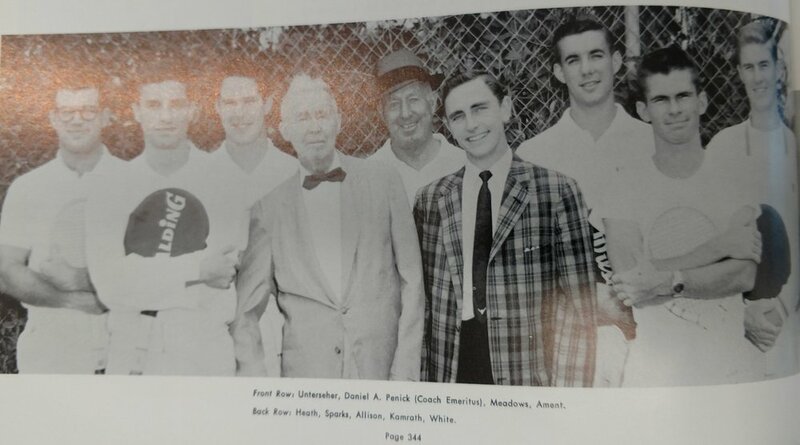 Wilmer Allison returns to the university in 1947 and serves as Penick's assistant until 1957. 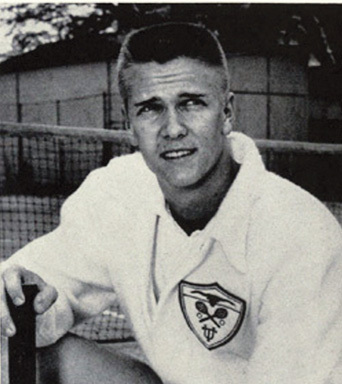 That year he becomes the head tennis coach at the university, where he serves until his retirement in 1972. He institutes a policy restricting athletic scholarships for tennis to players from Texas. 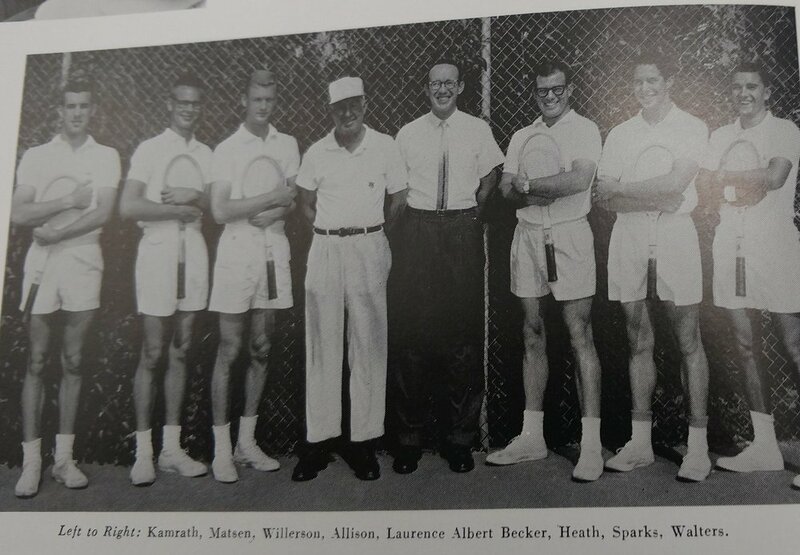 He is the 1927 Southwest Conference singles champion and the national collegiate singles champion. As Coach he develops 4 SWC team champions and 4 runners-up. Coaches his team to three single titles and one doubles title. 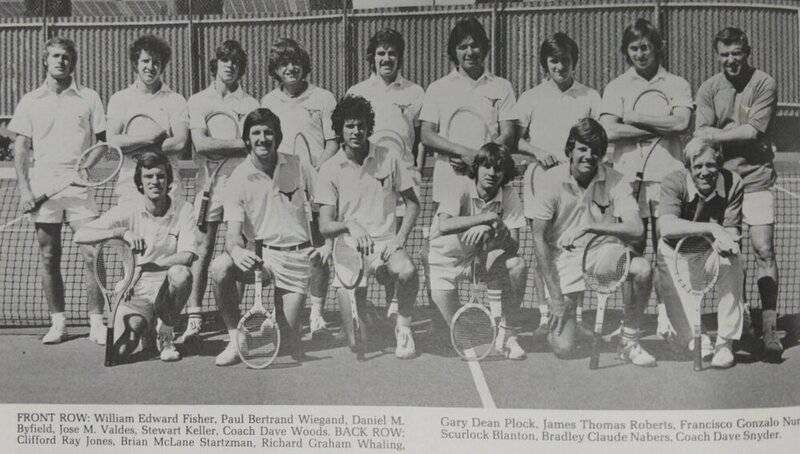 In honor of Allison, the "Penick Courts" at the University of Texas are renamed the "Penick-Allison Courts" in 1977. He is inducted into the Texas Sports Hall of Fame and the Longhorn Hall of Honor. In 1963 he enters the national and international halls of fame. 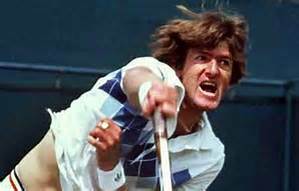 In Jack Kramer's autobiography he says that “Wilmer Allison had the best forehand volley I ever saw”. Sammy Giammalva is a ITA All American and a Davis Cup participant. Sammy Giammalva struggles but recovers and the team wins the SWC championship and wins the singles and doubles championship. Richard Keeton was the number 1 man on the team . Team placed 2nd in the SWC with runner up positions in singles and doubles. Texas finished 2nd in the SWC losing 4 matches to SMU and 2 to Rice. This was an outstanding team with great Leadership from White and Neil Unterseher. The Longhorns dominated the SWC members beating Rice 5-1, A & M 6-0, Texas Tech 6-0, and SMU 5-1. Season started awful with losses to Pan American, Trinity, St. Edward, and the University of Corpus christi. Team finally got on track against SWC foes and barely won the championship over Rice. David Nelson - a sophomore- shines this season. Team finishes second in conference play with Bill Driscoll and Leo Laborde having a 4-2 single conference record. In 5 years as Tennis Coach, Wilmer Allison has a 142-38 conference record and two SWC championships. Longhorns finished 3rd in the conference. Beat Baylor by one point to win the SWC championship. This year was feast or famine. There were no senior starters. The only lost one game in winning against 4 SWC opponents, but lost all games against two SWC opponents. Longhorns lost both the singles and doubles matches at the SWC meet. Coach Snyder said in 2012 that “When I came to UT, I knew we were going to change the culture of this team. Nobody was going to work harder than we were." Most victories of active NCAA Division I men's tennis coach's and ranked No. 2 on the all-time list with 697 career wins. Horns have a 7-1 record in dual meets but the winner of the SWC is the team that wins the most individual matches. Texas is 3rd in the SWC even though the Horns beat the winner of the SWC in a dual meet 4-3. The Houston Cougars join the SWC. Dan Nelson is the most valuable player for the Longhorns. Captain Daniel Nelson is All SWC and ranked 10th nationally. Stewart Keller and Gonzalo Nunes have a good year and will help the 1975 team. Close but no cigar. Horns played their toughest schedule in a long time- USC , Alabama, Miami, Oklahoma State, Oklahoma, and Trinity. The Horns started the season 25-1 with Trinity the only team that dominated them. Unfortunately, in SWC play they finished 2nd by one point to SMU. Trinity continues to dominate the Horns and the state of Texas..
Lost the SWC by three points to Houston . 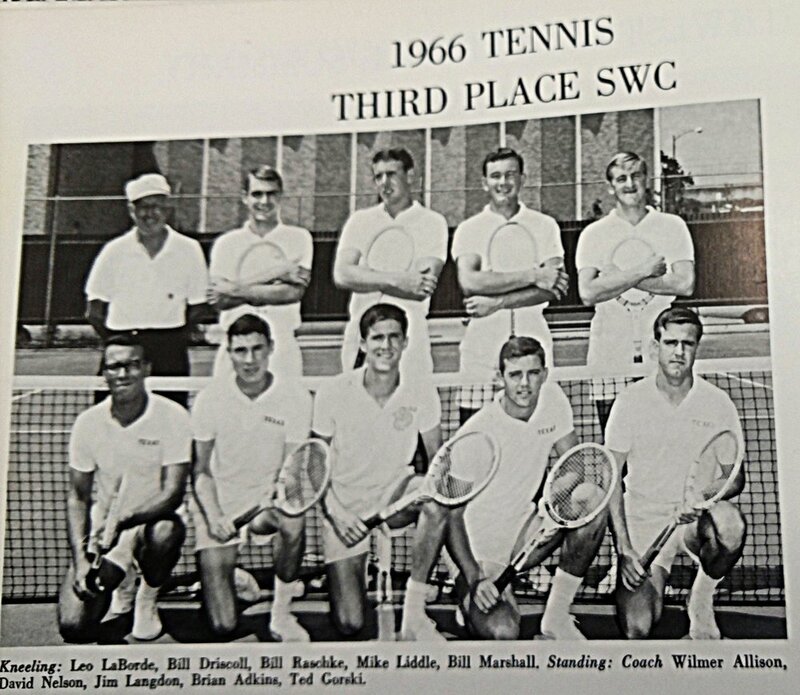 The first SWC title tournament to determine the SWC Championship was held in Waco. Won 4 of 9 singles and double events at the SWC tournament. The team upset Pepperdine this year. Steward Keller captured the #3 singles crown. Graham Whaling and Gary Plock won the number two doubles championship. Two freshman will make the Longhorns championship caliber for the next 3 years- Steve Denton and Kevin Currin. Each lost only one match in the SWC. Tennis court was renamed the Penick-Allison courts. Team wins the SWC for the first time in 10 years. The NCAA authorizes a single elimination tournament for the top 16 teams to determine a National Champion. Team makes the round of 16 in postseason. 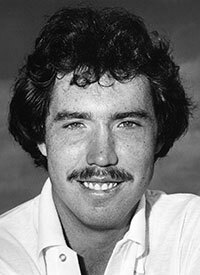 Kevin Curren - National Champion and All American in 1977, 1978, and 1979. Team was inexperienced with 5 freshman, 3 sophomores, and 1 junior. ITA national ranking system begins. 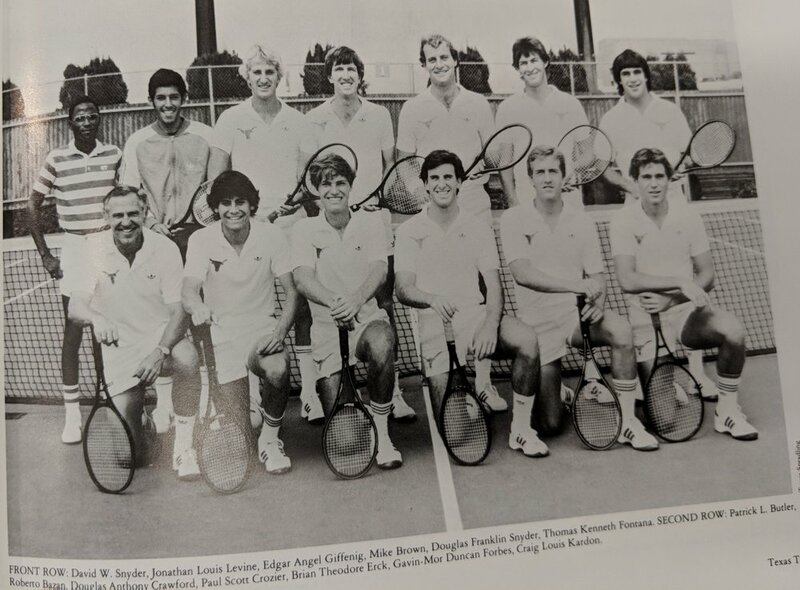 The Tennis team got off to a good start beating Miami, Stanford, and Harvard with Doug Crawford, Jonny Levine, and To Fontana leading the way. Texas makes the round of 16 in postseason and is ranked 11th. 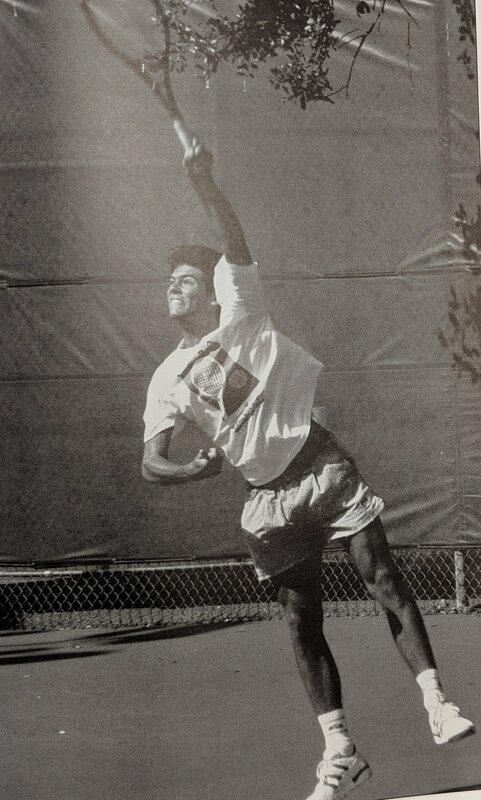 Jonny Levine is an ITA All American in 1983 and 1984 and finishes 2nd in the nation in singles. Horn upset SMU and Trinity. Team was ranked #12 in the nation. Jonny Levine was #3 in singles nationally and winner of the gold at the Pan - American games. On the team Fontana was ranked second to Levine. Levine made it to the 3rd round of the U.S. Open before being eliminated by Ivan Lendl. Team is ranked 11th - makes the round of 16 in postseason. "Perhaps" the toughest schedule of any Longhorn team with dual meets against #1 UCLA, # 7 Trinity, #9 Clemson, # 14 Ca;- Irvine. This team made quarter finals in Post season. This Team makes the quarter finals in postseason. Team is ranked 7th - makes the quarter finals in postseason. 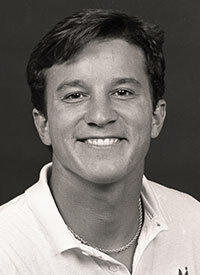 Charles Beckman is an ITA All American in 1985, 1986, and 1987. 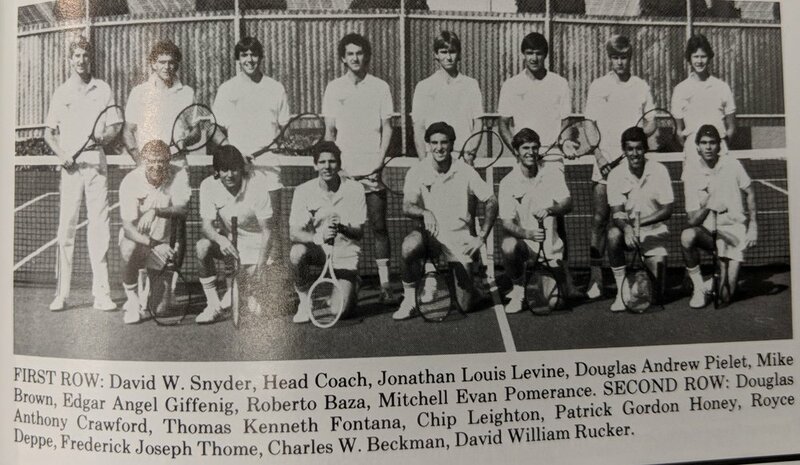 Charles Beckman and Royce Deppe are ranked nationally # 5 in 1984, # 2 in 1986, and #3 in 1987 in doubles. Team is ranked 15th - makes the quarterfinals in postseason. Team places 2nd in the SWC but makes the quarter finals in post season and finishes ranked # 13 in the nation. This team has promise but it did not materialize. Horns started Conference play with a 5 - 8 record. Ronnie Eddins and Michael Emmett jr.
Steve Bryan , Michael Penman ,and Mitch Michulka lead men’s tennis to the top of the SWC. Team is ranked 7th nationally and makes the quarter finals in postseason. 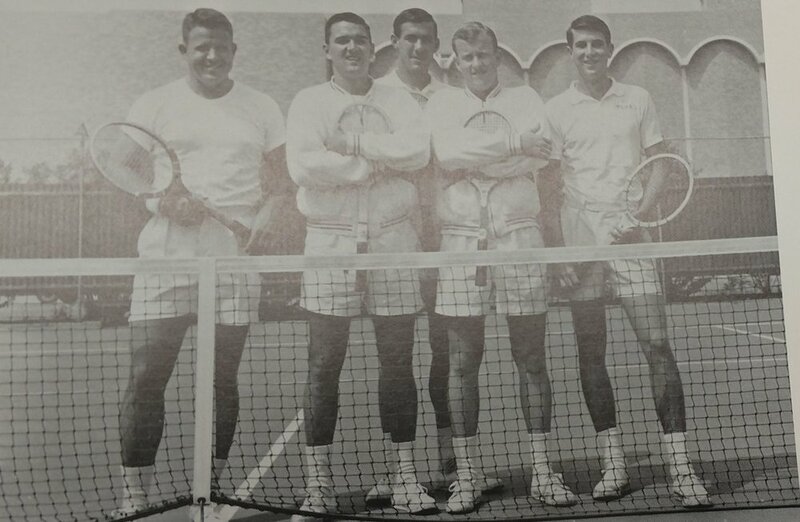 Coach Snyder wins the 1990 World Tennis Coach of the Year award. Mitch Michulka and Michael Penman are 2nd in the nation in doubles. Steve Bryan wins the National Championship, and is an All American in 1989 and 1990. 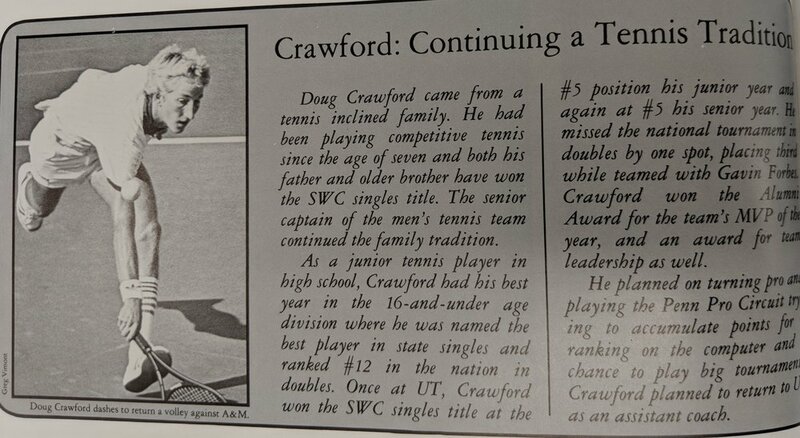 His career winning percentage is the highest winning percentage in the history of Texas Tennis at .822. 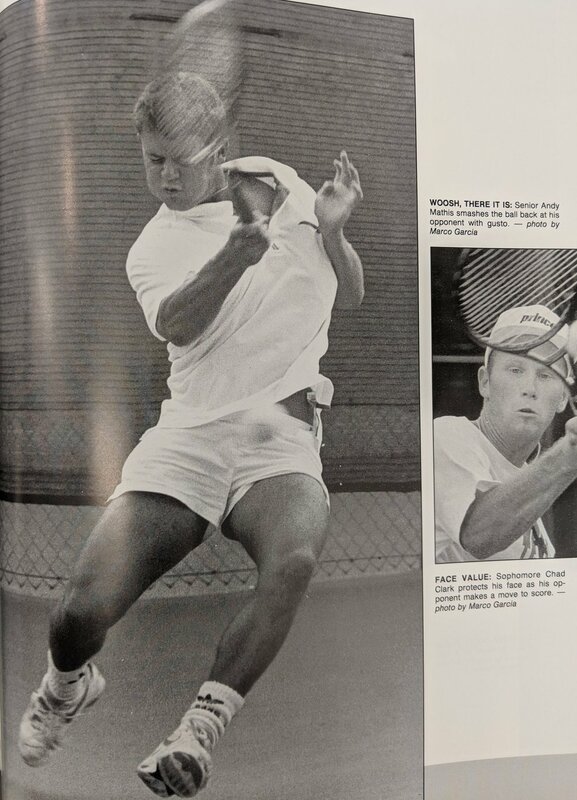 Steve is the 4th Longhorn to win a NCAA singles championship and he is inducted into the Intercollegiate Tennis Association (ITA) Men's Tennis Hall of Fame in 2007. He holds the school record for combined season victories with 70. Horns play 10 top tennis teams this year. Several setbacks plaque the team but they still qualify for the NCAA tournament. Men’s tennis team finishes second to TCU in the SWC tournament. The Horns beat New Mexico but lose to USC in the 2nd round of the NCAA tournament. Ander Eriksson and Trey Phillips are the only two Horns that have a nationally rating. Team is ranked 19th - makes the quarter finals in postseason. 1993 21-5 Coach Dave Snyder Pending #14 nationally and SWC Champs. Eriksson, Phillips , Williams, and Draper are all nationally ranked. In doubles Eriksson and Phillips are ranked 9th nationally. Chad Clark, David Draper and Trey Phillips returned from a team that place 3rd nationally the year before. Chad finished with a 97-30 record and was an All American. Horns placed 2nd in the SWC. 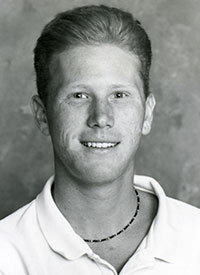 Chad Clark is one of only 3 Longhorns to finish in the top 10 in singles and doubles. He is the only Longhorn to complete this feat twice. He finishes 8th in the Nation in 1994. 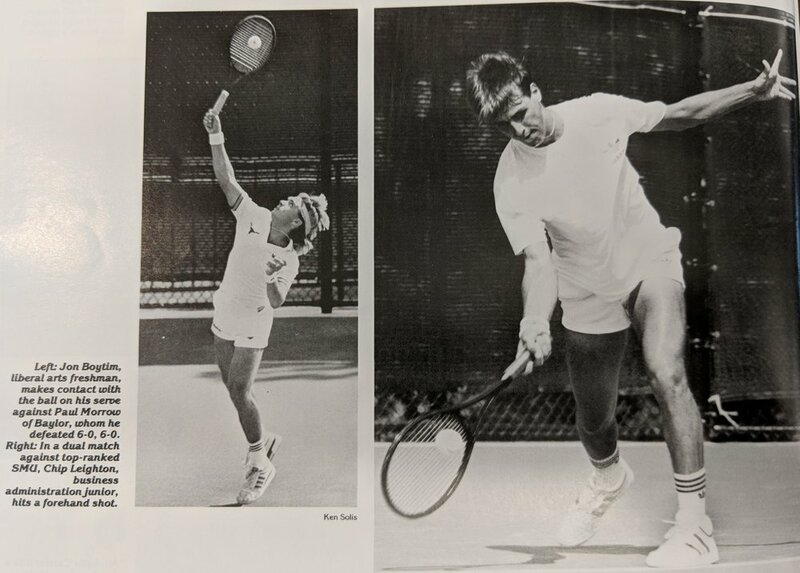 Chad Clark and Trey Phillips are ranked #4 in the nation in 1995 and 6th in 1994 in doubles. Team is ranked 9th - makes the round of 16 in postseason. Team is ranked 13th - makes the round of 16 in postseason. Team is ranked 10th - makes the quarter finals in postseason. Team is ranked 5th - makes the round of 16 in postseason. The NCAA tournament is expanded from 16 teams to 64-teams. Team is ranked 16th - makes the round of 16 in postseason. Michael Blue and Nick Crowell are ranked 10th nationally in doubles. Team is ranked 23rd - makes the second round in postseason. Team is ranked 15th - makes the round of 16 in postseason. Team is ranked 13th - makes the round of 16 in postseason and the 12 consecutive NCAA appearance. Team is ranked 36th - makes the second round in postseason. Team is ranked 28th - makes the second round in postseason. Semi-Finals In Postseason And Highest Ranking (3) In Texas Tennis History. University of Texas senior Callum Beale and Travis Helgeson and freshman Miguel Reyes Varela officially earned All-America status from the Intercollegiate Tennis Association (ITA). Callum Beale and Miguel Reyes-Varela are ranked 8th nationally in doubles. Travis Helgeson is ranked 7th in the nation in singles. Jon Wiegand receives the Provost Awards for posting a perfect 4.0 GPA during at least one semester in 2007. Team is ranked 12th - qualifies for round of 16 in postseason. Runner Up To Georgia For NCAA- Highest finish ever in a NCAA National Championship tournament. Team is ranked 9thmakes the final 4 for the 3rd time in Longhorn Tennis history. Dimitar Kutrvsky becomes Texas all-time winningest player with 230 victories. He is one of only three Longhorns to finish in the top 10 in singles and doubles. He is ranked 8th Nationally in 2010. Team is ranked 4th - makes the round of 16 in postseason. Dimitar Kutrovsky and Josh Zavala are ranked 7th in doubles in 2010. Team is ranked 16th - loses in the second round of postseason. Ed Corrie and Jean anderson are ranked 8th nationally in doubles. Team makes 2nd round of postseason and is ranked 23rd. Seren Hess-Olesen make the All American team. Team reaches the quarter final round for the NCAA matches. For the first time in program history, Texas Men's Tennis advanced to the quarterfinal round of the NCAA Singles and Doubles Championships . Søren Hess-Olesen is one of six players in the nation to finish top-15 in both the singles and doubles polls. He is the 6th Longhorn to finish in the top 10 in singles . He is the ITA Senior Player of the Year and ranked 6th in the nation in 2015. Søren Hess-Olesen and Loyd Glasspool NCAA double champions.